Focused ion beam (FIB) systems have been produced commercially for more than twenty years, primarily for large semiconductor manufacturers. 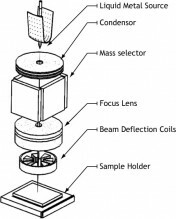 FIB systems operate in a similar fashion to a scanning electron microscope (SEM) except, rather than a beam of electrons, FIB systems use a finely focused beam of gallium ions that can be operated at low beam currents for imaging or high beam currents for site specific sputtering or milling. 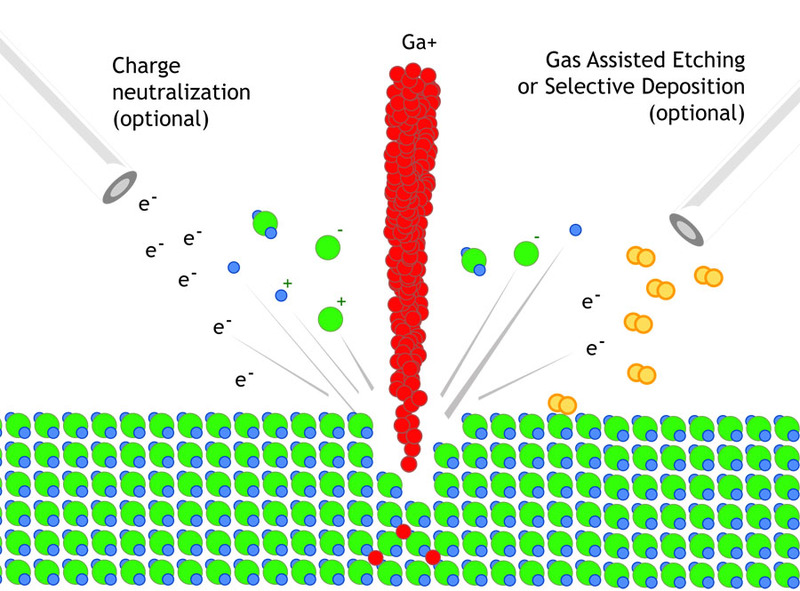 As the diagram on the right shows, the gallium (Ga+) primary ion beam hits the sample surface and sputters a small amount of material, which leaves the surface as either secondary ions (i+ or i-) or neutral atoms (n0). The primary beam also produces secondary electrons (e-). As the primary beam rasters on the sample surface, the signal from the sputtered ions or secondary electrons is collected to form an image. At low primary beam currents, very little material is sputtered. Modern FIB systems, such as our newest Zeiss system, can achieve under 1 nm imaging resolution. At higher primary currents, a great deal of material can be removed by sputtering, allowing precision milling of the specimen down to a submicron scale. If the sample is non-conductive, a low energy electron flood gun can be used to provide charge neutralization. In this manner, by imaging with positive secondary ions using the positive primary ion beam, even highly insulated samples can be imaged and milled without a conducting surface coating, as would be required in a SEM. In addition to primary ion beam sputtering, our system permits local "flooding" of the specimen with a variety of gases. 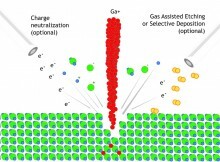 These gases can interact with the primary gallium beam to provide selective gas assisted chemical etching, or selective deposition of (either) conductive or insulating material, enabled by the primary ion beam decomposing the deposition gas. Until recently, the overwhelming usage of FIB has been in the semiconductor industry. Such applications as defect analysis, circuit modification, mask repair and transmission electron microscope sample preparation of site specific locations on integrated circuits have become commonplace procedures. The latest FIB systems have high resolution imaging capability; this capability coupled with in situ sectioning has eliminated the need, in many cases, to examine FIB sectioned specimens in the SEM. As well as offering a full suite of semiconductor FIB services such as device modification, probe pad formation and TEM specimen preparation, Fibics Incorporated has pioneered a number of applications of FIB in materials science. These applications extend from site specific TEM specimen preparation of "difficult" materials, such as thin coatings of TiN on high speed steel through to applications in measurement of crack growth and aspect ratio during stress corrosion cracking, deformation of metal matrix composites, adhesion of polymer coatings, et cetera. If you have any further questions about Focused Ion Beam Systems, please contact us.